Hiring a Lawyer in WA State? 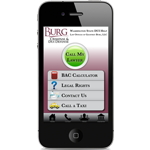 Choose Burg Criminal Defense. This may be the first time you have faced the need to hire a Washington state criminal defense lawyer and you may feel intimidated and overwhelmed. Most importantly, you should find an attorney that is a good "fit" for you. This is an attorney who excels at the practice of law in the area that you are facing your charges and who you feel comfortable working with. It must be someone you can trust to fight hard for you and to give you good legal advice. Q: What should I look for in a criminal defense lawyer? Experience as a criminal defense lawyer and experience with your specific type of case. The best lawyer for you is one who has represented many people with similar cases and who dedicates their practice to helping people in situations like yours. We limit our practice to representing clients accused of crimes in Washington State and have combined over 37 years of experience. We are happy to meet with you and discuss our specific experience with cases like yours.